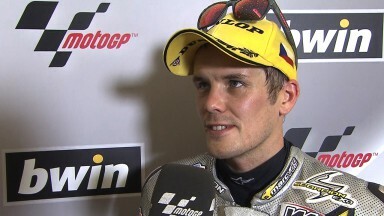 He may not have been completely speechless, but Mika Kallio was certainly overcome with joy on Sunday after celebrating his first win in the Moto2™ class. Kallio had taken victories in the intermediate class under its former 250 guise, although his last success had come at Donington Park some five years ago. At Brno on Sunday, the Marc VDS Racing Team rider – teammate to championship leader Scott Redding – put in a controlled and well-judged ride for the top podium step. “I don’t know what the right words are, it’s unbelievable,” the emotional Finn explained after the race. “The whole weekend has been really consistent and I pushed all I could in the race. I was quite confident before it that we could keep up a good race pace; the plan was to make a good start and be at the front of the group, making a good rhythm all of the time. I mainly managed to do that, so I’m really happy. Looking ahead to this weekend’s Hertz British Grand Prix at Silverstone, Kallio is sure that positives can be extracted from the race despite a lack of past results there. The Czech Grand Prix victory and its reward of 25 championship points elevated Kallio from fifth to fourth position in the overall Moto2™ standings. He now trails third-placed Tito Rabat (Tuenti HP 40) by just seven points.